The basement lab near the University of Washington campus is, literally, buzzing. High-voltage machines produce energy that will soon run through cables snaking along the seafloor. A dozen engineers hunch over electronics, making alterations or running checks. In one corner, a nitride-coated titanium shaft has been sitting in a bucket of saltwater for four months to test the coating for corrosion. A glass-walled cleanroom prevents contaminants from interfering with seals on housings designed to keep out seawater pressing in at 4,200 pounds per square inch. This is crunch time for University of Washington preparations to build the world’s largest underwater observatory. 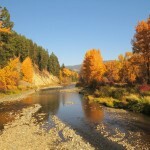 The National Science Foundation in 2009 launched the $239 million effort, pending availability of funds and Congressional approval. 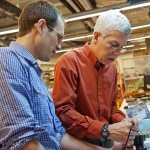 John Delaney, UW professor of oceanography, leads the project to create a cabled observatory that will bring power and Internet to the ocean floor. This new concept will use remote-controlled instruments and high-bandwidth video to create an enduring, real-time presence in the deep ocean. Researchers in the UW’s Applied Physics Laboratory were tasked by Delaney to build and test the equipment that will make up the observatory. Much of that equipment will be installed this summer. This is the biggest project the 70-year-old marine engineering institute has ever undertaken, said project lead Gary Harkins, a principal engineer with the lab. 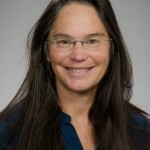 “This concept of a real-time observatory will change what we do as ocean engineers, what we will learn how to do, and what ocean scientists can do with these systems now and in the future,” Harkins said. The cabled observatory, known as the Regional Scale Nodes project, is part of the national Ocean Observatories Initiative, an effort to integrate U.S. measurements of the ocean and seafloor. Other partners will build coastal and global observing networks, manage the data and conduct educational outreach. The Pacific Northwest observatory will span the Juan de Fuca tectonic plate off the Washington and Oregon coasts, the likely source of the next large regional earthquake. 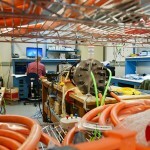 Deep-ocean junction box, center, being built and tested by engineers at the UW’s Applied Physics Laboratory. The devices must withstand corrosive seawater, near-freezing temperatures and crushing pressures found two miles below the ocean surface. 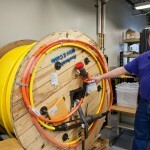 Larry Nielson, an Applied Physics Laboratory field engineer, with a 1 kilometer-long underwater cable that will reach from the backbone cable to sites of scientific interest, such as underwater volcanoes. The orange cable will connect to a scientific instrument, and the orange plug is designed to be gripped by a robot. Applied Physics Laboratory engineer Mike Harrington leads development of the science junction boxes. Known as secondary nodes, these manage power and communications for the scientific instruments. Nine are scheduled for installation this summer off the Washington and Oregon coasts. 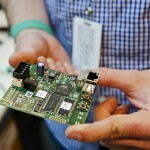 A mix of custom and off-the-shelf electronics nodes convert instrument data running along copper wires into digital signals that will travel on optical fibers to computers around the world. 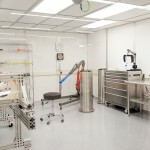 Engineers will don protective clothing to assemble sensitive parts in this cleanroom, with a special apparatus to align heavy parts. Clean and tight seals are essential to keep out seawater at very high pressure. 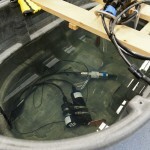 One of the 40 scientific instruments being installed this summer is tested in a saltwater bath. Each instrument is also pressure-tested to as high as 5,200 pounds per square inch. Dana Manalang, Applied Physics Laboratory ocean engineer, holds a high-precision pressure sensor that will be installed this summer. UW oceanographer Giora Proskurowski and Zoe Parsons, an Applied Physics Laboratory field engineer, assemble a 3-D temperature sensor array that Proskurowski designed. The completed instrument includes 24 sensors that will create a real-time, 3-D temperature map around a submarine hydrothermal vent. All parts that will make contact with the seawater are built from aircraft-grade titanium to minimize corrosion. These are aluminum parts that would soon corrode in seawater. This summer the team will lay 18 custom cables measuring as long as 3 miles (5 km). These shorter orange cables are filled with oil so they will remain flexible in the deep ocean. 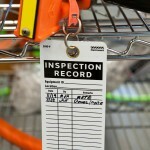 Each piece of equipment is inspected before use. Many are tested in saltwater and at pressures greater than they will experience when deployed. Morgan Catha, an engineering technician, consults on his soldering work with Geoff Cram, an engineer at the Applied Physics Laboratory. Circuit boards are designed to fit in the available space for years of continuous and reliable operation. 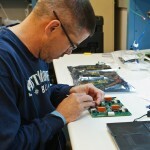 James Tilley, an Applied Physics Laboratory electrical engineer, works on a circuit board that will be installed in a secondary node. Six high-voltage primary junction boxes were installed last summer by telecommunications contractor L-3 MariPro. This seventh one, a spare, sits on the sidelines in the UW lab. Yellow cables installed this summer will plug into these. The next months will be busy as engineers, scientists and collaborators finish assembling the pieces that will be installed over 60 days of ship time during July and August. Most of the regional network’s components will be built from aircraft-grade titanium because the material is strong and resists corrosion, which is crucial for electronics that will spend decades in saltwater. “We are having a notable impact on the non-aircraft market for titanium,” remarked Applied Physics Laboratory engineer Geoff Cram. Even so, most components must be designed to be switched out for possible repairs or upgrades during the observatory’s projected 25-year lifespan. Over the past two summers, the backbone cable and high-voltage junction boxes were laid by telecommunications contractors. This summer’s deployments venture into uncharted territories. The team has booked 60 days of ship time on the UW’s Thomas G. Thompson research vessel for three cruises in July and August. Researchers will install lower-voltage cables that run from high-voltage nodes closer to the areas of scientific interest: deep-ocean volcanoes, seismically active plates, and an underwater ridge that seeps energy-rich methane gas. While the engineering team readies the components, the science team is mapping out the science plan and finalizing the cruise details. “The timeline isn’t forgiving on this one,” Cram noted. In design work over the past four years, the engineers have considered how to protect the infrastructure from a possible failure by any of the components – some of which are experimental, and none of which has operated for this long at these pressures. They also have created a common time stamp for all the data, since scientists might want to make precise comparisons of measurements taken by different instruments at opposite ends of the network. They will do their best to protect all the instruments from ships, waves, marine animals and corrosion. As the team finalizes the design, engineers have to ensure the sensors don’t interfere with each other. They also have to dissipate heat from the electronics, which give off about as much heat as a 60-watt light bulb but, in a tightly sealed housing, could still fry instruments. A high-definition video and still camera that will provide live footage, starting this summer, to researchers and the public. 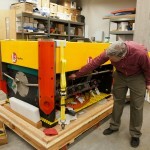 Seismometers to provide early warning of earthquakes or volcanic eruptions. 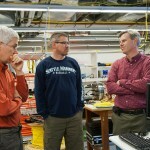 Commercial oceanographic sensors, including three precision pressure sensors built by Sea-Bird Electronics of Bellevue, Wash.
Water samplers built by UW oceanographer David Butterfield. Some samples will be stored until researchers collect them; others will be analyzed in place to detect the seawater’s chemical and genetic contents. Chemical sensors, developed by UW oceanographer Marv Lilley, that will go inside the hydrothermal vents. 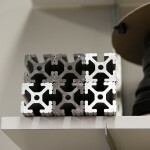 These will be inserted slowly so fragile ceramic parts survive the transition from near-freezing water to 570 ºF (300 ºC) temperatures inside the vent. 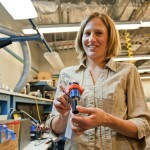 Seafloor pressure and tilt sensors, developed by Bill Chadwick at Oregon State University, that detect pressure buildup below the ocean floor. UW engineers have designed the system to digitize all this data and send it back to land via the cables in a few thousandths of a second. Miles of underwater cable will arrive during coming weeks to a UW storage facility on Lake Washington. The engineering team will expand there as it builds components and outgrows its campus lab space. The next few months will be hectic, said Harkins. Some of the UW researchers will join the telecommunications contractor to run a month-long final check of the backbone cable system from the Newport, Ore. shore station. 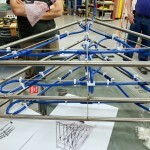 UW engineers will build and test 10 secondary nodes to drive the instruments that will be installed this summer. Members of the engineering team will work with contractors and scientists to run pressure tests and perform final checks on their instruments. Yet another team is developing a profiling system that records data in the upper 650 feet (200 m) of the ocean. That system is perhaps the most technically challenging aspect of the whole observatory, researchers said, and won’t be installed until summer of 2014, but initial testing will begin this summer at the UW’s Friday Harbor Laboratories. Forty-six UW faculty and staff members are putting in long hours on the cabled observatory, including 15 on the science team and 31 on the engineering side. For more information, contact Nancy Penrose, UW’s OOI Communications Coordinator, at 206-221-5781 or penrose@ocean.washington.edu.